Llegar desde el aeropuerto Ft Lauderdale hasta el puerto de Miami puede ser complicado, pero no debería ser. Deje a un lado las preocupaciones, con esta cómoda opción evitará los inconvenientes de alquilar un coche o pagar un taxi después de un vuelo. Simplemente introduzca sus datos cuando haga su reserva y su traslado compartido será confirmado al instante. Cuando aterrice, muestre su bono al conductor y suba a bordo del vehículo. El servicio está disponible las 24 horas del día, siete días de la semana, por lo tanto, no importa cuál sea la hora de llegada de su vuelo. Ride was on time. Driver was polite and lifted my heavy suitcases. It was to have been a private limo but they packed others in and dropped folks off along the way. The return trip with Executuve limo GoShuttle was excellent! Driver made a separate, unannounced stop at a private residence. Still go to my destination on time, but it was interesting. Did not know that you had to find and check into a kiosk first. The drivers seemed a little disorganized when picking up from the curb. Otherwise, no complaints. You can pay the same price from the kiosk at the airport, so don't expect that you're getting a deal by purchasing through this site. Very easy and reliable company. Used this company before and it's been great service with me. We showed up and the attendant for the shuttle informed us it would be $11 per person. We had paid over $16 with a coupon through Viator. 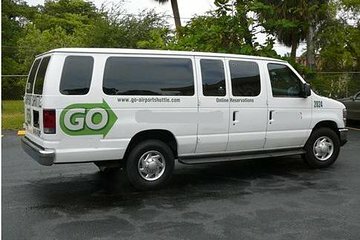 Exact same shuttle and company... Wish I hadn't done it on advance! arriving=excellent,departing=poor,could not understand/nor did dispatcher speak good English. Had to wait a little bit but nice drive!